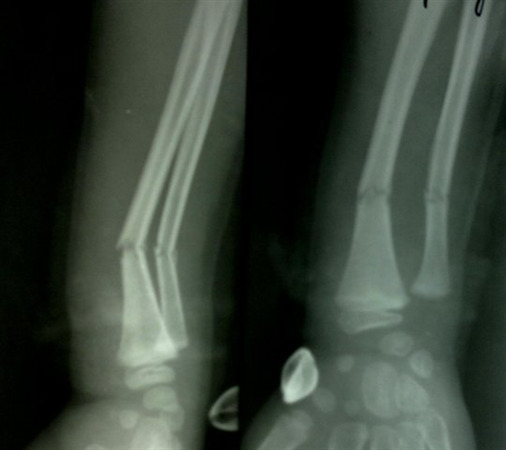 distal radius (and ulna) is the most common site of pediatric forearm fractures. 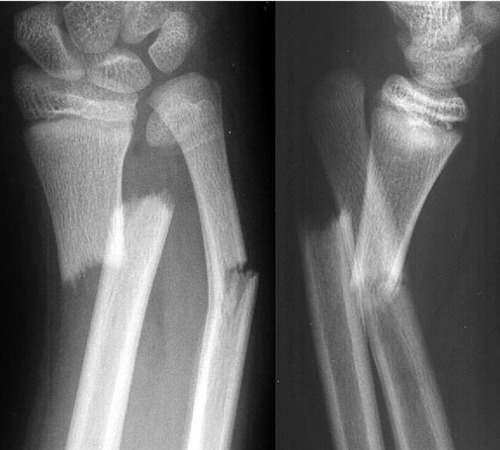 although uncommon, compartment syndrome and neurovascular injury should be evaluated for in all forearm fractures. Bayonette apposition, or overlapping, of less than 1 cm, does not block rotation and is acceptable in patients less than 10 years of age. General guidelines are that deformities in the plane of joint motion are more acceptable, and distal deformity (closer to distal physis) more acceptable than mid shaft. 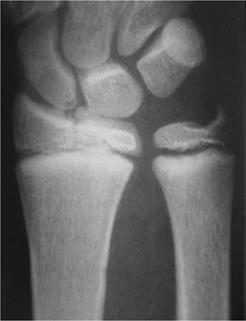 The radius and ulna function as a single rotational unit. Therefore a final angulation of 10 degrees in the diaphysis can block 20-30 degrees of rotation. 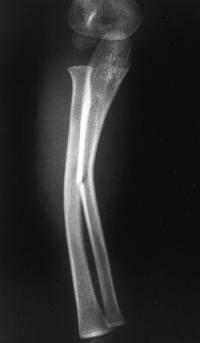 *Rotational deformities do not remodel and are increasingly being considered as not acceptable. 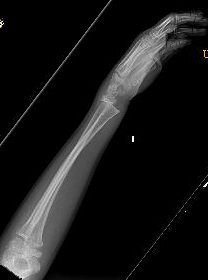 all forearm fractures serial radiographs should be taken every 1 to 2 weeks initially to ensure reduction is maintained. 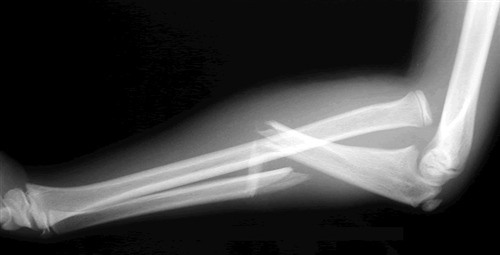 historically consisted of a long arm cast for 6 to 8 weeks with the possibility of conversion to a short arm cast after 2-4 weeks depending on the type of fracture and healing response. 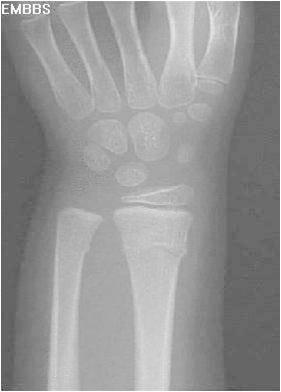 multiple high quality studies show fractures of distal third may be immobilized with a properly molded short arm cast. 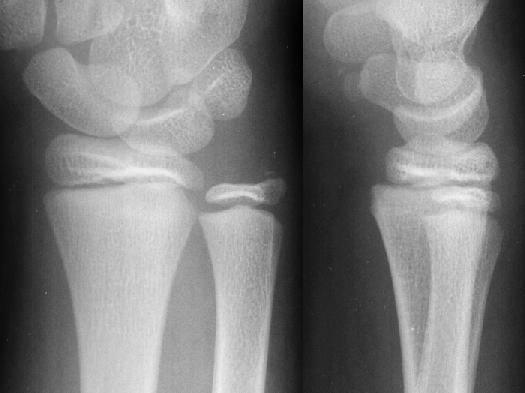 special case of fratured distal radius with intact ulna: extreme ulna deviation of wrist helps keep radius fracture out to length. 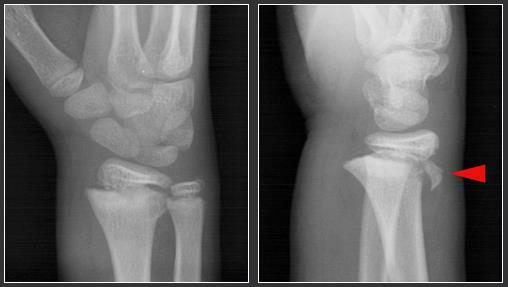 HPI - A 14-year old male presents on the same day as a left wrist injury. Injury films are shown (excuse poor quality). Closed reduction is performed, and a splint is placed. 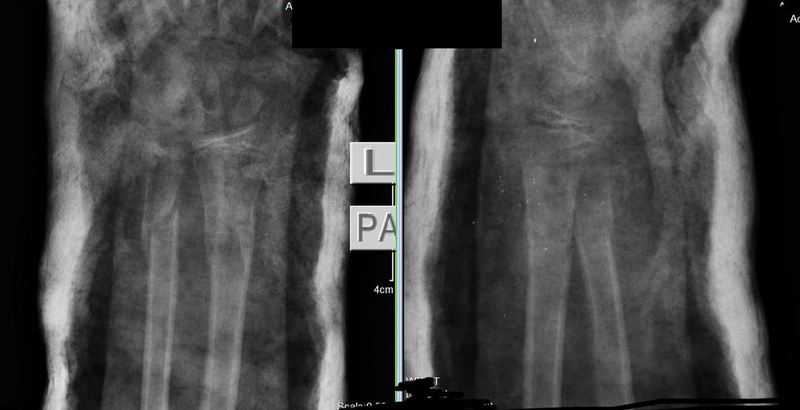 Post reduction films are shown below immediately after the reduction and after 5 days when the patient returns to clinic. Now that the patient returns 5 days later, how would you treat him based on the Post-procedure P2 films below? HPI - 10 year old girl fall on ground 3 weeks ago. She was treated with closed reduction and long arm case in full pronation. She is now 3 weeks out and presents with the radiographs shown. 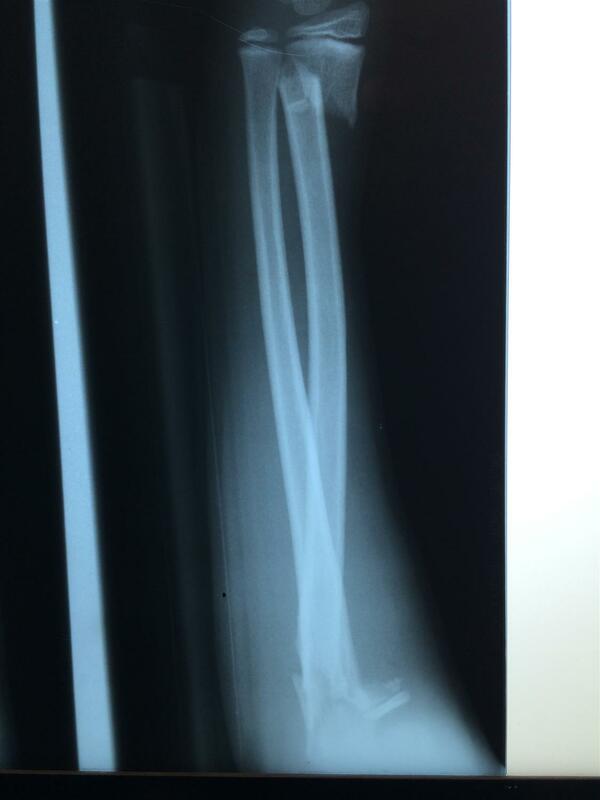 How would you treat this fracture now that it is 3 weeks out from the fracture.